The P.A. system squeals to life, and the 500 travelers sprawled around Gate 202 fall silent, so silent that I can actually hear the sound of 500 people holding their breath. "Attention passengers traveling on Emirates flight 73 to Paris..." The 2-second pause that follows feels like 2 thousand years. "We will be boarding the aircraft by zone. Please check your boar..." We stop listening; our collective sigh of relief causes a wind tunnel effect across the gate. I have no doubt that everyone around me is feeling exactly as I do: hesitant. Not one of us will dare believe that this is really happening - that an aircraft will depart Dubai and fly into Charles de Gaulle Airport - until the plane touches down at its intended destination. By pure chance, luck, coincidence – whatever you want to call it – I just happened to be awake and watching CNN at 3:00 AM this morning, when the news broke that airports around Paris would begin to resume service today. 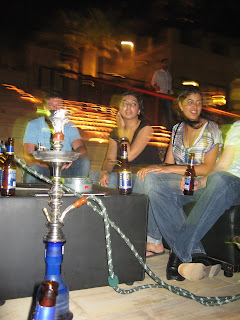 I had just returned from a night of debauchery, Dubai-style: drinking cocktails and puffing on hookah pipes at Jambase shisha bar, and later salsa dancing with an Egyptian named Samir at Trader Vics. The evening was planned as a farewell party of sorts for one of the lucky travelers at the Holiday Inn who had secured a flight out the next day. We were 11 in all - a group of virtual strangers that I was perfectly happy to bail on in favor of staying in and sleeping. But had I done so, I wouldn’t have had such a wild night out. I wouldn't have been awake at 3 AM. And I certainly wouldn’t have been one of the first to learn that a sliver of hope had broken through the dark cloud over Paris. A Hookah pipe makes everything seem OK.
At that very moment, I decided it was time to get out of Dubai come hell or high water; this much-awaited easing of restrictions in France provided an opportunity to do just that, and I wasn't about to let it pass me by. With the encouragement of mom and the financial blessing of my employer, by 4:00 AM I was packed, checked out and on my way to the airport. The news was accurate: a flight back to Paris was scheduled and confirmed to depart in 4 hours. This alone was a miracle. 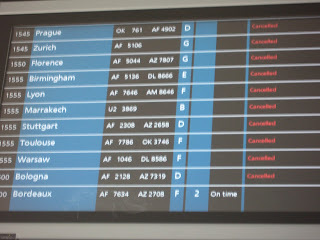 The airport was still reasonably quiet as word about Paris had not yet spread. Regardless, I knew that securing a seat on this flight would involve a battle, and I was prepared for the fight. The reservation agent confirmed what I had expected to hear: he wasn't authorized to sell any seats; I would have to stand by for this flight, just wait and see. With determination and relentlessness as my guides, I put on an Oscar-worthy Damsel In Distress performance – tears, messy stories, little white lies - and quickly won over the handsome Emirates Airways supervisor. In exchange for one outrageous charge on my Visa card, he approved the sale, and handed over a boarding pass for the first and possibly only flight out that morning. Holding this precious document in my hand, I felt a strong urge to kiss it. I think I did. Maybe I should have kissed the supervisor instead. And so it is: I am on my way! But as I sit at the boarding gate now, I can't help but think how anti-climactic this will all turn out to be. As the hopeless hours grew into hopeless days, I had begun to envision all the fabulous adventures I could create from this otherwise irritating situation. Hopping on a flight to Destination: Anywhere; road-tripping with strangers across the continent; taking trains through unknown cities and beautiful landscape. Or blowing off Europe altogether and venturing toward Israel, Bali, Nepal, anywhere but here! I felt unreasonably envious upon hearing of other peoples' adventures and crazy travel plans to get home. It all sounded fabulous, exciting, and utterly complicated. But alas, the end of this story for me will be a drama-free one. 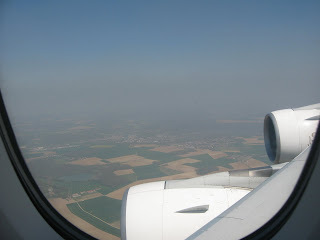 Direct flight back to Paris, 30-minute taxi ride from there. Believe me, I know how lucky I am right now. I know I struck gold by getting on this flight. But as much as I cannot WAIT to get out of Dubai and be on my way back home, I can't help but feel a strange sense of let-down. What can I say, that's just me. 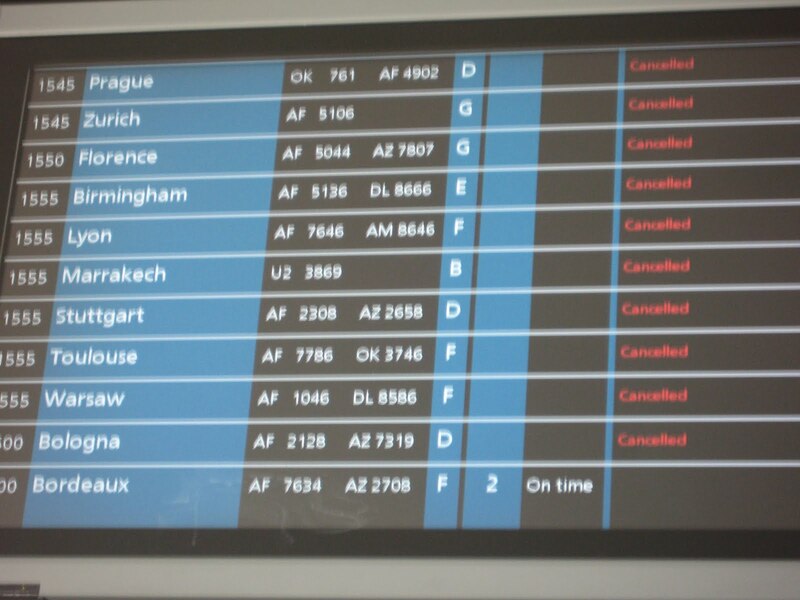 The departure board at CDG. I am one very lucky gal.